We all love to have cheese. It has been a part of daily life in many of the countries like America, Australia, Europe and so on. In India, a different form of cheese is used, called cottage cheese or ‘paneer’. Unlike traditional cheese, cottage cheese is not fermented. Fermented cheese is found to be more nutritious than the cottage cheese. There are different types of cheese like Blue, Brie, Monterey Jack, Gouda, Cheddar, Swiss, American cheese and so on. It is regarded as a fatty food but it has lots of health benefits and is very nutritious. Cheese is rich in proteins, riboflavin, Vitamin A, calcium, Vitamin B12, zinc and phosphorous. 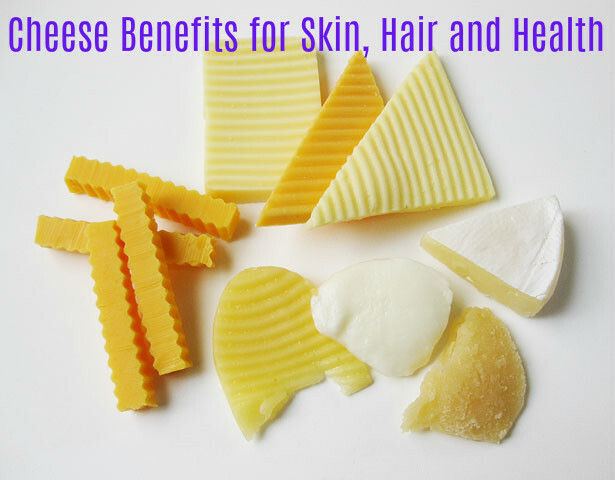 Cheese is not only good for your health, but it also is great for your skin and hair. We all love to have a healthy and glowing skin that is free from blemishes. Cheese can provide you the glow you have desired on your skin. Cheese is rich in Vitamin B, which is very beneficial for the proper metabolism of cells and their growth. This helps in providing you a glowing skin. It is also effective for getting rid of blemishes on the skin. Cheese is great for providing you a healthy and glowing skin. This is because of the presence of Vitamin B in it. By consuming cheese, you will have a smooth, supple and healthy skin with a natural glow. So you can include cheese in your daily diet to have a healthy and beautiful skin. Cheese that is low in fat is full of proteins. You can include this cheese in your breakfast or lunch and have it with eggs, fruits and fresh berries. Cottage cheese is a good source of calcium, which is essential for giving you healthy and strong hair with natural shine. Cheese contains high amounts of calcium and Vitamin B, which are excellent for providing healthy bones in children, elderly people as well as pregnant and lactating mothers. So, consuming cheese provides you strong bones. Vitamin B is good for absorbing calcium and distributing it to various parts of the body. Being a rich source of calcium, cheese is very beneficial for providing you strong teeth. The lactose content, which is harmful for the teeth, is low in cheese. By consuming cheese like Blue, Brie, Monterey Jack, Swiss, Cheddar, Gouda and American cheese, you can prevent tooth decay. You can have them as snacks or consume them after a meal. This is one of the best benefits of cheese. When sodium and cholesterol are high in your body, you may suffer from high blood pressure. Salt present in cheese depends on the amount of salt mixed with milk before making cheese. You can buy low-sodium cheese, which contains less salt in it. Low-sodium salt is good for reducing diseases of the heart. Vitamin B in cheese has the power to lower high blood pressure. Cheese has the ability to induce sleep. So, if you are suffering from insomnia and loss of sleep, try consuming cheese. It contains Tryptophan, which an amino acid that helps in lowering stress. This in turn induces sleep. So, you will have a good sleep at night ad wake up refreshed. Cheese is good for your immune system. Some types of cheese help in the proper functioning of the immune system. Consuming cheese makes your body stronger and more resistant towards various diseases and illnesses. If you suffer from migraine headaches, cheese is a good remedy. Taking in calcium helps in reducing problems of migraine. Cheese, as you know, is rich in calcium. So, you can treat migraine by consuming cheese. You suffer from osteoporosis when your body lacks calcium. This results in a decrease in bone density. It is more common in women who have undergone menopause, elderly people and children who are undernourished. Cheese helps in providing your body enough calcium in a natural way. So, consuming cheese makes your bones healthy and strong protecting them from diseases like osteoporosis. Presence of calcium, proteins, minerals and vitamins in cheese help in treating osteoporosis by allowing proper absorption of calcium by the body. Having cheese is great for reducing PMS problems in women and symptoms associated with it. Very few people are aware that cheese has the ability to prevent cancer. This is because of the presence of Linoleic acid and Sphingolipids in cheese, which can fight against cancer cells. It is also rich in Vitamin B, which is needed for maintaining various functions of the body and to protect your body from various diseases. By consuming cheese, you can ensure that you have a smooth pregnancy. This is because of the high content of calcium in cheese. Calcium is very much needed when woman is pregnant. Calcium is very beneficial for stimulating the contractions during labor. Calcium is also required for producing milk, so that the baby gets enough milk and grow properly. Cheese is loaded with natural fat, which help you to gain weight. So, if you are underweight, consume cheese regularly and soon you will gain weight. Some cheese contains low amounts of fat and helps in keeping a balance in the body weight. Along with body weight, cheese also helps in increasing the weight of muscles bone density. Cheese is a rich source of calcium, fat, vitamins, proteins and minerals, which play a major role in making the muscles and bones strong. They also maintain a balanced metabolism.